No Chinese meal in India is complete without the ubiquitous Sam's Red Chilli Sauce. 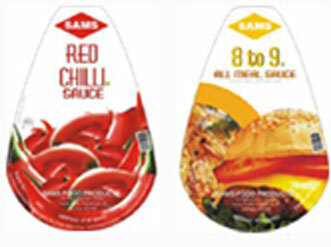 Sam's Foods has over 20 food products and is the unmatched leader in its category - in market share, in price and in taste. Our brief was to change the packaging that was not touched since the company's inception. The Nucleus team is in the process of redesigning the entire product line - giving it a bold, fresh look. The main challenge before us again was our own mantra - consistency. How does one give the same look and feel to a Chinese Schezwan sauce, to an English Worcestershire Sauce, an Italian Pizza Sauce, French mustard and an American Mayonnaise? Plus Mango, Pineapple Mixed Fruit Jam? And to top it all - an 8 to 9 All Meal Sauce!!!! The results were simply brilliant, even if we say so ourselves.